If you’ve dreamed of owning your own portable hot tub, then you should know that you aren’t alone. There are many of us who have dreamed of soaking in that hot 100 to 104-degree water to let our muscles unwind from the day and to relieve our stress. 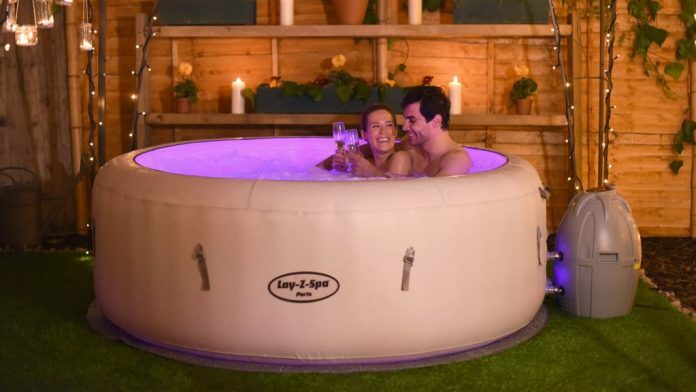 Some of us dream of being able to slip into one after work and some of us dream about hanging out with our friends in one of these portable hot tubs and maybe having a couple of drinks. I don’t know about you but a hot soak and a mimosa sure sound good to me right now. Before you can enjoy the luxury and the therapeutic benefits of a portable Jacuzzi, however, you have to find one that not only suits your lifestyle but also your budget. This isn’t easy nowadays because it seems like a new model is introduced every other day. However, don’t let that spoil your dreams. Spend a little bit of time doing your research and you’ll end up with the best inflatable hot tub in your price range that has the features you need to relax your day away. In order to help you find the portable spa of your dreams, I’ve compiled a list of the top ten inflatable hot tubs that are currently available and have given you a short review of what they have to offer. After you’ve read that, I advise that you then look at my guide for finding and buying an inflatable hot tub. Once you’ve done that, you’ll be in a much better position to discover a portable whirlpool bath that will suit your particular needs. Comfortably seating four people and outfitted with a number of great features, the Coleman SaluSpa is one of the best blow up hot tub models that you can currently find nowadays. It’s equipped with a nice cushioned floor and massage jets that allow you and your friends to just lounge back and enjoy a nice hot soak. The outer walls of this unit are soft fabric and it has two handles that make it easier to move and empty this unit. Other features that can be found in this model include a digitally controlled pump and an easy to replace filter cartridges that can be swapped out to keep the bubbling hot water clean and refreshing. It’s a model that’s sure to provide years of fun. With a 177-gallon water capacity and a quick and easy set-up, the Lay-Z-Spa Miami is a portable spa that gets high marks on many of its excellent features. This model can fit between two to four people and not only has a heating system that warms the water quickly and efficiently but also a water-filtration system that ensures that the water in the tub is as clean as it can be. Other features of this unit include an easy-to-use digital control panel and an automatic on/off heating system that can be controlled by a timer. It’s a model that’s good for hanging out with your significant other or with a couple of close friends. 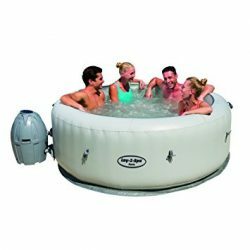 This blow up hot tub is designed for those individuals who are looking for a model that they can soak in and relax in with three of their friends. It features the patented Lay-Z-Massage system which helps soothe sore muscles and drain stress from your body. This completely portable model also has a rapid heating system to warm your spa water quickly and an integrated water filtration system that keeps the water sparkling clean. And if you need to turn up the heat while you’re still in this tub, then you can do so with its enclosed control panel without having to brave the cold outside air. This unit is perfect for date nights or relaxing with friends and family. The Intex PureSpa is a bubble massage spa that can seat for people and has a number of unique features that will make it a useful addition to just about anyone’s backyard, deck or patio. It has a hard-water treatment system that softens the water and makes it a lot easier on your skin. It also features an insulated cover that locks—this serves both to ensure the water stays hot when no one’s in it and acts as a safety feature. Other features of this model include a heating system, 210-gallon capacity, a seating capacity of approximately 6-people and a thermal ground cloth. The Comfort Line Spa-N-A-Box is a unit which sets up quickly and ready to be filled with water in about 20-minutes. Once assembled, this portable model has a number of great features which help relax the user’s muscles and help them on their road to relaxation. It has a 1000-watt heater that’s thermostatically controlled and maintains a stable, comfortable temperature while in use. It also has a water filtration system that keeps the water sparkling clean and a micro-air jet system that delivers micro-bubbles while a 1.3 horsepower Turbo Wave Massage system pulls the ache out of your tired muscles. The SaluSpa Paris is a model that can be set up and ready to receive 250-gallons of water in only a few moments. Its I-Beam construction ensures that it has superior structural stability, while at the same time offering a smooth comfortable surface. This unit can easily hold 4-6 people and heats up the water quickly using an automatic on/off the timer-controlled heater. One of the best features that can be found in this hot tub, however, is it’s integrated LED light system which can cycle through 7-different colors and give occupants of the tub a visual experience while the water ebbs their cares away. Slipping into an Intex PureSpa is a sure way to relax your tired muscles and ease the stress of the day away. This spa model can hold approximately 6-people and provides almost instant relaxation with just the touch of a button. Once inside the warm waters of this unit, you’ll be soothed by 170 high-powered bubble jets that massage your cares away. Other features of this model include an integrated filtration system, an insulated cover with lock and a carry-bag for transporting it. It can easily be set up and taken down and has a water temperature range between 68 and 104-degrees. The PureSpa Jet Massage Set has everything a person needs for a nice relaxing soak. This easily inflatable model can be ready to get filled with water in as little as 20-minutes. It warms the temperature of the water quickly and at the push of a button. Another great thing about this model is that it has an easy-to-use control panel that controls the four high-powered jets that are around the interior of the hot tub—thereby providing you with a nice gentle massage. And once you’re done using this unit, it can be easily broken down for easy transport or seasonal storage. The Vanish Spa is a portable system that removes all of the hassle and frustration of owning a traditional spa by delivering one that does the same job but is a lot easier to use and maintain. This model features eighty-eight massage air jets and a water temperature that can be increased to 104-degrees. This produces the perfect relaxing environment to soothe aching muscles and bubble away all of your cares. Another great feature of this model is that it has a matching cover and inflatable lid. If you’re looking for a simple spa that isn’t too complex, then this one might just fit your needs. Able to seat 4-people comfortably, this insulated therapy spa is what some people are looking for in a spa. It’s a soft and portable model that can be easily inflated and deflated and holds approximately 315-gallons of water. Other features of this unit include a built-in filtration system, an underwater light, and 8-jets that soothe away all of your worries. This simple model also has a PVC frame that makes it sturdier than many of the cheap inflatable import models that have been flooding the market. If you’re looking for a no-frills hot tub that’s sturdy and does a fine job of heating your water, then this model might be one you’ll want to look at. Once you’ve bought your inflatable Jacuzzi, you’ll want to make sure that you maintain your investment by taking the best care possible of it. Here are a few tips to make sure that you keep it clean and you get the most out of your investment. While you don’t have to empty out your unit every day, you certainly don’t want to fill it up and never empty it. You’re going to have to empty it on a regular basis. If it’s being used daily, then be sure to change the water every week. On the other hand, if you only use it a couple of times a day, you can wait two to four weeks before you have to change it. 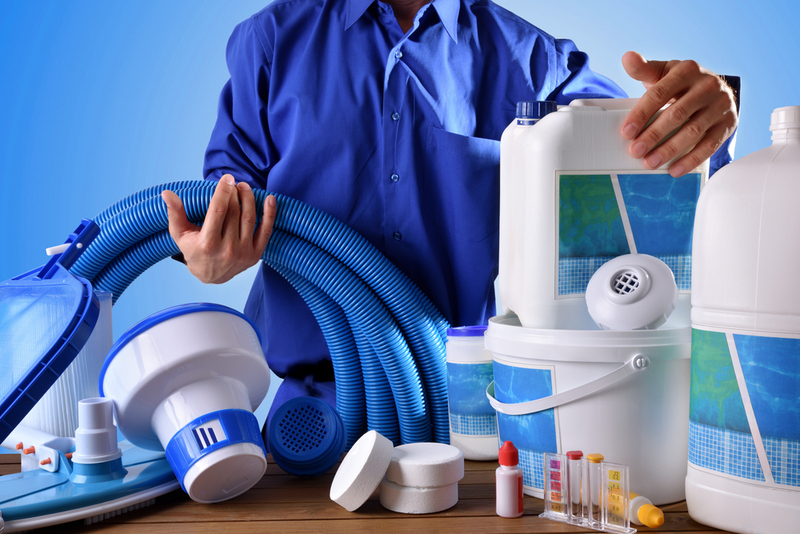 After you’ve cleaned your unit, make sure that you take the extra time to clean it and not just replace the water. Bacteria and other substances can cling to the interior of the hot tub after it has been emptied, so you’re going to want to clean the sides of it with warm soapy water and a soft washcloth. Be sure that when you clean your tub you don’t use abrasive chemicals because these can break down the material that the spa is made of over time. Some models already come with a water softener, so obviously, this rule doesn’t apply to those models. However, if your unit doesn’t have a water softener, then you should consider on installing one that will soften the water before it is added to your tub. This will keep the filters from being clogged with calcium and putting an undue strain on the pumps. It also prevents time-consuming maintenance later on down the road. Another thing that needs to be done on a regular basis is checking your water filters. Clean or change them according to manufacturer’s recommendations. This will keep your inflatable spa in top working condition. Your water will not only be cleaner because of it but it will also keep your pump from burning out prematurely. Keeping a cover on your spa will ensure that leaves, bird droppings and other types of debris don’t end up in your unit. Keeping it covered will also ensure that the water stays warmer longer and reduces the tub’s heat-up time. Another thing that should be considered to keep your spa water in the best condition possible is taking a shower or bath before getting in. This will prevent the dirt and grime from your day ending up in your tub. It also prevents your personal bacteria from being transferred to the water and making some form of bacterial soup. Of course, the above suggestions are exactly that—only suggestions. However, I would like to emphasize that following the above steps will not only ensure that you tub time is the best it can be but will also help you keep it in good working condition longer. Remember, if you take the time and effort to keep your spa clean and well-maintained, then you’ll ensure that it will be around for many years to come. Now go out there and find the best model that you can find.